Last October we moved into an old house in the Emmental, built around 1872. The former owner was a gardener by trade, and the property is filled with all kinds of flowers, fruit, trees, bushes, herbs, succulents, and weeds. Every week we find new surprises—a little wall full of wild strawberries, a blackcurrant bush hidden beneath some giant rhododendrons, a small vine of apricots growing along the side of the garage, and a whole patch of blueberry bushes. 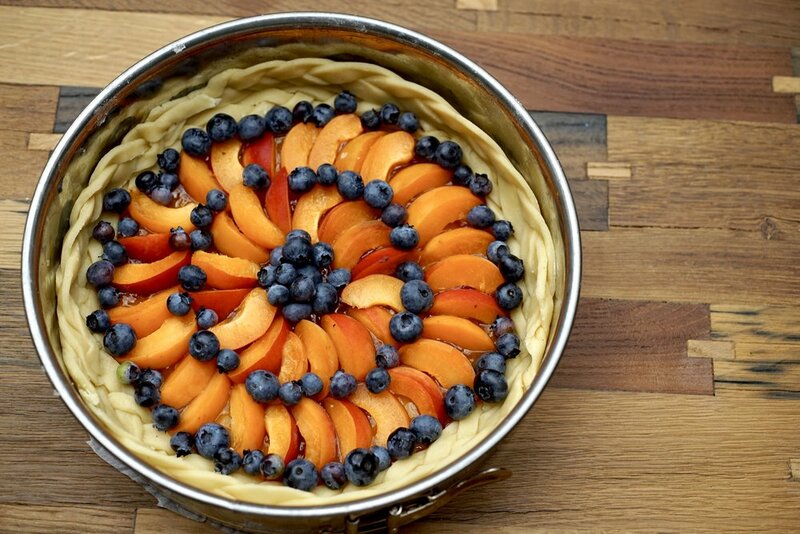 One great way to use all of these fruits is in a Crostata. Crostata is a tart, at times sweet or savoury, enjoyed throughout Italy and also Ticino. There are countless versions—jam fillings with lattice tops (crostata marmelatta), piles of fruits in the middle of the dough with the sides flipped up to hold in the juices (crostata di frutta), smeared with ricotta and lemon (crostata di ricotta), or with big globs of Nutella (crostata alla Nutella). Again, inspiration came from Marianne Kaltenbach, who lists Crostata in her book of favourite Swiss baking recipes (Meine liebsten Backrezepte). In my version, the fruit lies on a bit of jam, and I made a fancy braided border. To save time you can always skip the border and just flip up the sides to hold in the fruit. Make a well in the middle of the flour and add the water. Mix this gently until a dough forms. Do not overwork the dough or it will become tough. Press the dough into a disc, wrap with plastic, and let cool in the fridge for at least an hour. Roll out the dough into a round and place it on a parchment lined baking sheet. Spread with jam, top with fruit, and then flip up the sides to contain the inevitable runaway juices. Roll out three quarters of your dough and line a 10 inch / 26 cm round tart pan. 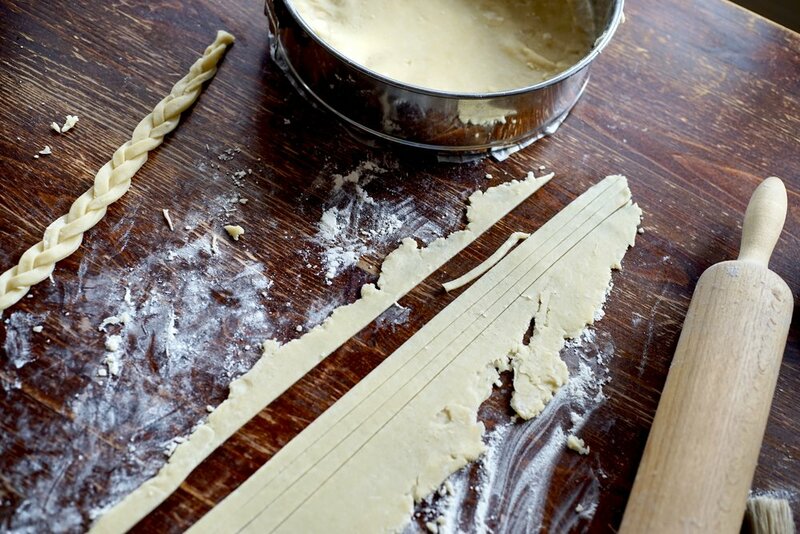 With the remaining dough, make two long braids and then place these around the border of the tart—one flat along the border of the dough, and the other standing along the sides of the pan. Spread the jam over the dough base, then arrange your fruit on top in a pleasing manner. Bake for about 30 minutes, or until the jam bubbles up and the crust is lightly browned on top and on the bottom. Lots of different fruits would work here—any stone fruit, blueberries, blackberries etc. Instead of jam, try a thin spread of ricotta. Make sure the bottom of the tart is sufficiently baked through and browned on the bottom before taking it out of the oven.